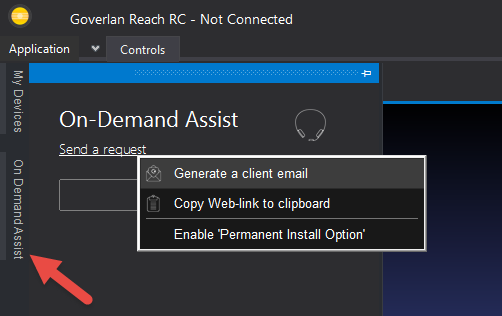 For Goverlan to manage computers over the internet, you must implement a Goverlan Reach Server within your organization, and enable the Gateway services. Once the Goverlan Reach Gateway Services infrastructure is implemented, Goverlan operators can remotely manage computers over the internet in unattended, or on-demand modes. The unattended mode allows privileged access and management of an endpoint without end-user interaction. The remote computer can also be managed if no user is logged-in to the machine. Once an external endpoint is equipped with the Goverlan Client Agent, this one registers to the Goverlan Gateway under the organization ID provided. 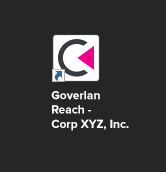 It is then accessible via the External Devices area of the Goverlan Reach operator console. You must have the local admin credentials of the target system. You may enter them in the Goverlan Credential Manager to store them for later use. Remote UAC must be disabled. You will need to add the following registry change to the remote system. Mobile users within your company, using laptops equipped with the Goverlan Client Agents automatically monitor whether they are connected to the private network (either directly or via a VPN), or if they are connected to a public network. In the latter case, they register themselves to the Gateway server for unattended management. On-demand assistance allows an operator to temporarily assist any user over the internet. The operator sends an assistance request to the user, this one accepts it and grants temporary access to the computer. This mode is explained later in this article. External computer nodes are organized by folders defined by the organization name assigned to the computer as well as by any Active Directory hierarchy of remote client sites. 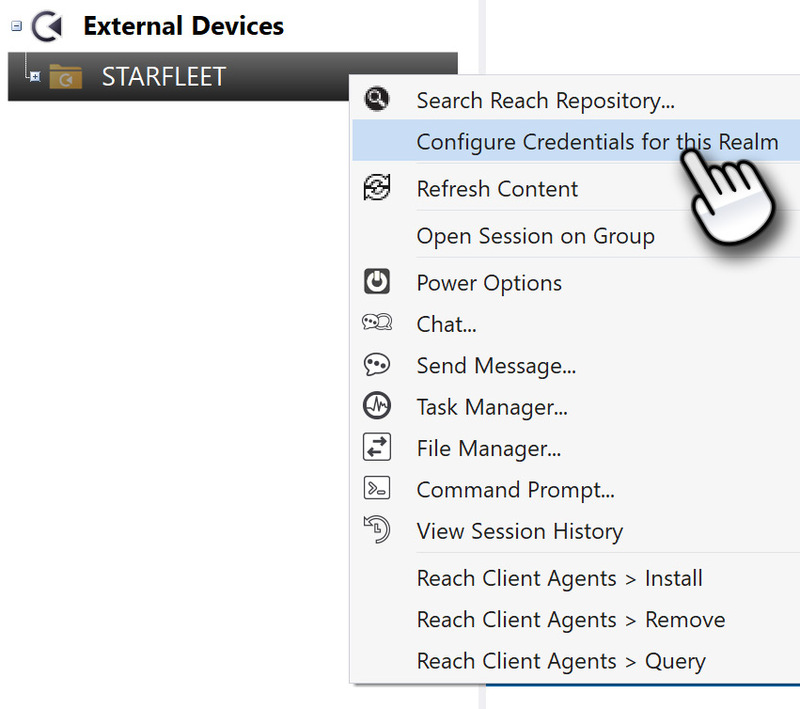 The External Devices area can be browsed, searched and used to configure the alternate credentials to access machines. To browse the External Devices area, simply double click on any organization container to disclose the sub-containers or the computers it holds. The folder hierarchy is defined by each node’s organization name configured in the Goverlan Reach Gateway services (or individually via the Goverlan Client Agent control panel applet), and the AD path of the computer if this one belongs to an active directory. The active/offline status of a node is indicated via its computer icon. Offline nodes cannot be managed as they are either Powered OFF or may be back on the private network (in case of traveling corporate users). You can easily access an external computer by searching for it. External device searches can be executed whenever a computer name is prompted in Goverlan, or within the External Devices area. Enter a partial node name including wildcard (*) before or after the search string to view all External Devices matching your search criteria within the selected container. Whenever Goverlan prompts for a computer name, you can execute a search against external devices by specifying the prefix REACH: followed by the node name or search string. 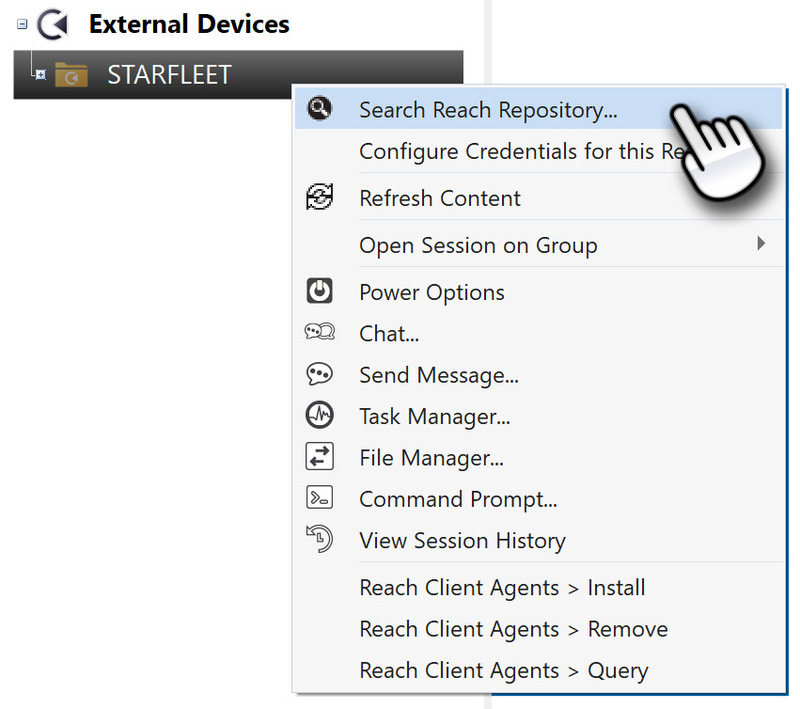 The REACH: prefix indicates to Goverlan that the computer is outside of your private network, and the connection must go through the gateway services. The connection string above assumes that SOME-OUTMAC-001 is registered at the root of the External Devices Area. However, most computers will use an organization name or their local Active Directory Domain information to register themselves. If the exact path or name of a computer is not known, use the * wildcard character in the connect string. For instance, enter REACH: SOME-OUTMAC-001* and a search for SOME-OUTMAC-001 will be initiated, irrespective of its location within the External Devices Area. 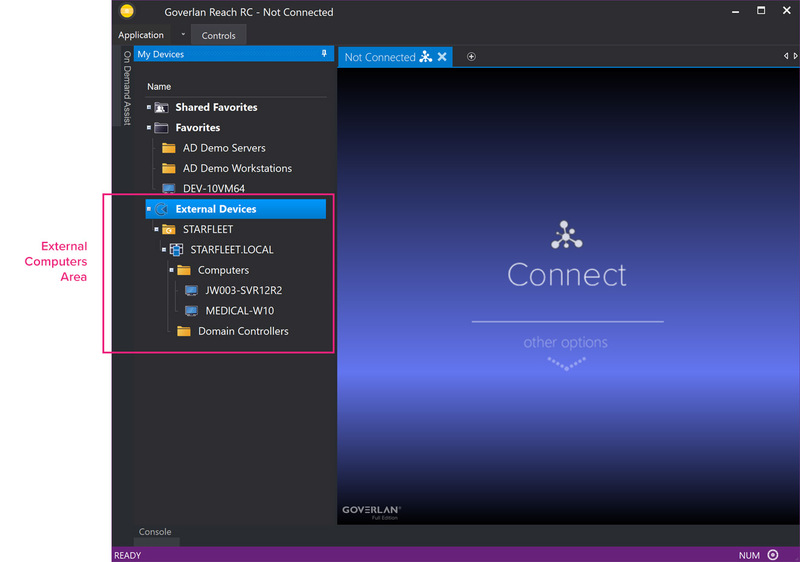 REACH:Domain Controllers* Returns all machines registered in any Active Directory container titled Domain Controllers across all client sites. The access and management of an external computer in unattended mode requires proper authentication and authorization. By default, Goverlan uses the technician’s credentials to authenticate against the remote endpoint. If this fails, alternate credentials are prompted. The alternate credentials specified must hold local administrative privileges to initiate a remote control session or perform management tasks on a remote endpoint. You can specify alternate credentials on a per-machine basis; however if a common local administrator’s account is available on machines that belong to the same container, you can also pre-configure credentials at the container level. Initiate a management action on the remote machine and wait for the Goverlan credentials prompt. Once the credentials have been configured, they are reused for subsequent connections to the same machine. These credentials can be modified or removed via the Credentials Manager. Specify the credentials to be used for all the nodes that belong to this realm. Make sure to indicate the proper authority in your credentials. On-demand access provides instant remote management services of any computer over the internet. An On-Demand request can also be used to generate an installer for an unattended installation. Click on the Send a request to start the process. Generate a client email – Automatically launches your default email client with a template that includes the web link that the remote user must click on to start the session. Copy Web-link to clipboard – Copy the web link to your clipboard. This is useful if you are in a live chat with the remote user or want to generate a customized email request. Enable Permanent Install Mode: Enable this option to generate a client support package that exposes the Authorize permanent access option to the remote user. Permanent installations will make the node available for both attended and unattended support session. Once the end user receives the assistance request and clicks on the provided web link, he/she will be instructed to download and start the Goverlan Client Assistance program. 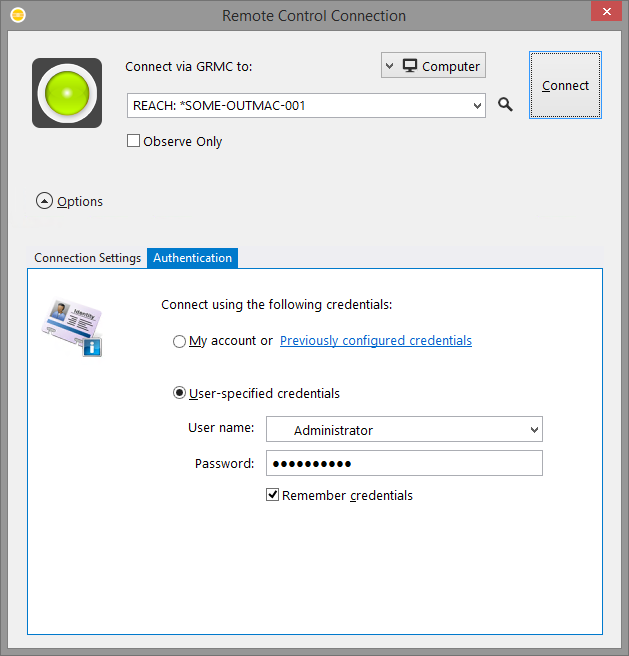 To provide unattended management access to the computer, the user should select the authorize permanent access option, then click on the Provide Unattended Access button. This option is only visible if Enable Permanent Install Mode was selected while generating the on-demand assistance request. 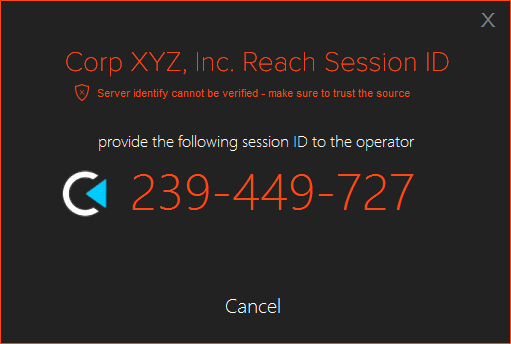 If the Reach Client is started without local administrative privileges, the user is presented with the provide administrative access option. Ask the user to enable this option if you wish to gain access to UAC prompts. 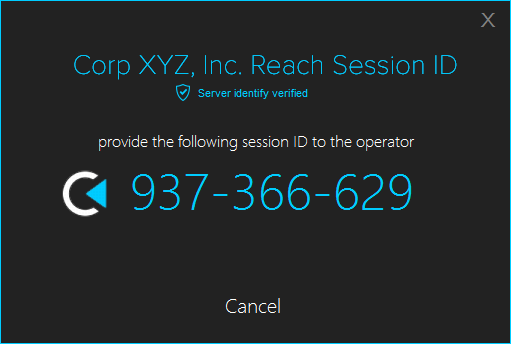 Once the session ID is received, the Operator enters it in the On-Demand Assist panel and clicks on the Connect button. This actively starts the remote assistance session. 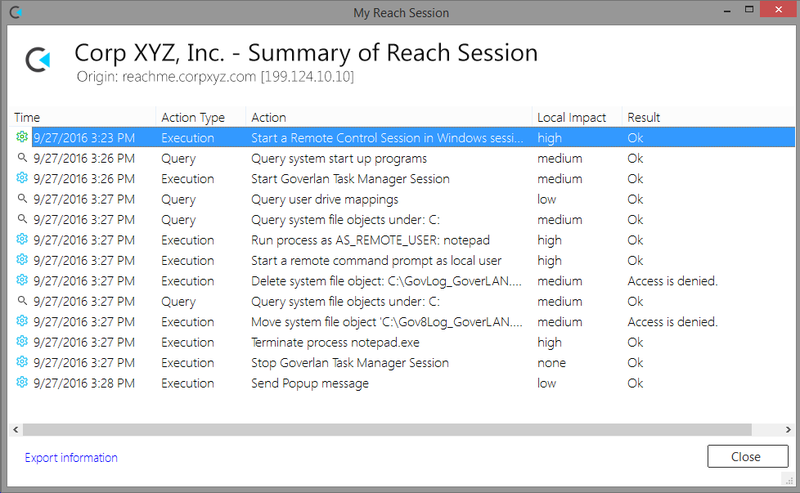 You can use the session ID in any of the Goverlan tools that prompt for a computer name using REACH:SESSION-ID as the computer name. To end a support session, the remote user must click on the End Support Session button. It is important to understand that the remote computer is accessible as long as this window is opened. It doesn’t stop when an operator closes a connection or finishes a task. 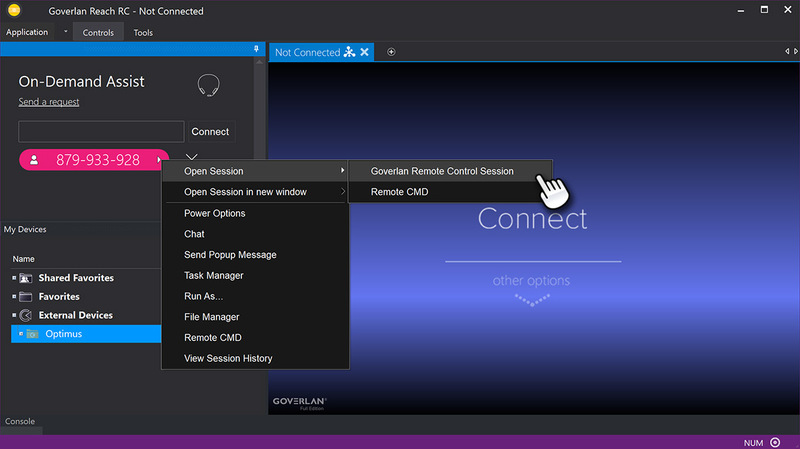 The session ID can be used to reconnect to the remote computer by one or more operators simultaneously until the End Support Session button is clicked by the remote user. 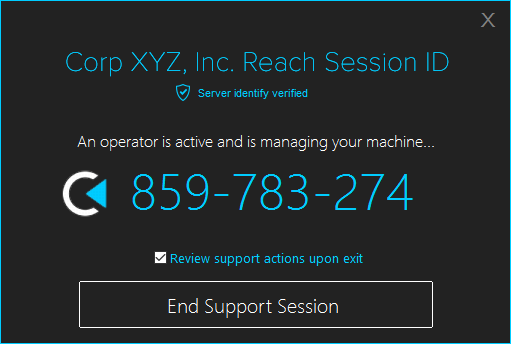 Selecting Yes generates a shortcut on the user’s desktop that can be used at any time to re-open a support session. During an On-Demand Assist session, all Operator actions are audited and logged. By default, these audits are recorded in the local machine’s Application log of the Event Viewer. However, the user can choose to review these actions by selecting the Review support actions upon exit option. This option must be enabled before clicking on End Support Session.